Rumour has it that in the docks of Shanghai, sea captains used to have a most unusual way of recruiting personnel: unsuspecting sailors, with no plans to sail out any time soon, were kindly treated to a drink or two, only to wake up the next morning, with a terrible hangover, on board of a ship already at open sea! How is that for the violation of human rights?! This way of personnel recruitment was generally referred to as being ‘Shanghaied’. 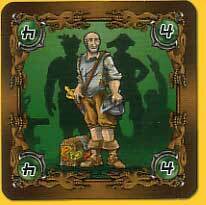 In this game, two captains try to recruit a complete crew in the local bar, using their dice. They have to choose from sailors of eight different nationalities (colours), five per colour, with the values 1, 2, 3, 3, 4. Every round, six sailors (cards) enter the bar. 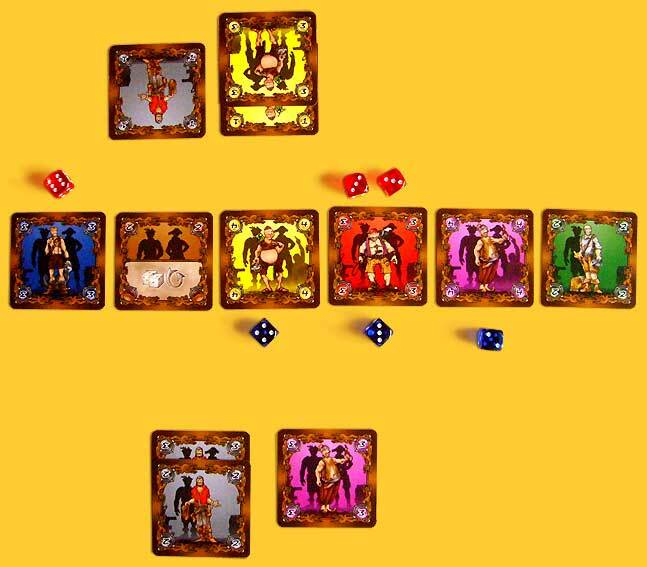 They are placed face up in the middle of the table, and both captains reach for their dice! In a turn, a player always throws with two of his six dice. He then chooses one of these dice, and places it next to a sailor. Not just at random: a ‘2’ has to be placed with sailor number 2, and a ‘5’ with sailor number 5 et cetera. The first player of each round determines whether the leftmost sailor, or the rightmost sailor is designated ‘number 1’. After placing one die with a sailor, it’s the other player’s turn. This continues until one player decides it’s time to ‘Shanghai’: quit with the dice, and load those drunken sailors onto your ship! This is already allowed as soon as a player has at least two dice that are allocated to a sailor, and it becomes mandatory when a player doesn’t have two dice left to throw with. After the call ‘Shanghai’, the players determine who gets which sailor. If only one die is allocated to a sailor, he goes to the owner of that die. 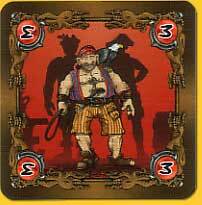 If there are multiple dice, the card goes to the player with the majority of dice allocated to that sailor. If both players have the same number of dice, the tie is broken by adding up the values of the dice on the adjacent sailor cards. If they’re still tied, nobody gets the card and it is removed from the game. Cards without any dice are also removed. Both players place their sailors in front of them. For the new round, six new cards are placed face up on the table; after eight rounds, the cards are finished and the game is over. 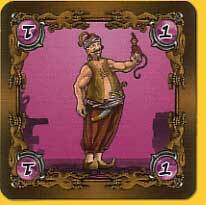 Then, for each colour, both players add up the values of the cards they collected. The player with the highest value wins the hand, and the victory points he gets equal the value of the cards of the losing player. The losing player gets nothing. In the event that only one player has cards of a specific colour, he doesn’t get the number of victory points equal to the value of the cards of the other player (which would be 0), but to the value of his own cards. In case of a tie, nobody scores. 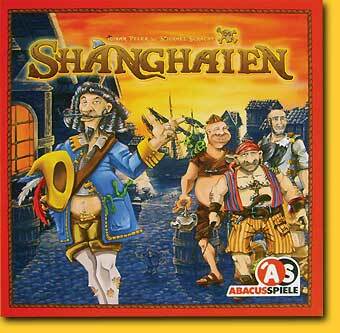 Shanghaien is an extremely simple game to play, but surprisingly difficult to really master! Because you throw with two dice and you can choose only one, your choices are limited... but none the easier! How bad do you want a card, and how bad is it if your opponent gets it instead? If you are going strong in a particular colour and you expect to be able to keep the majority until the end of the game, you would also like your opponent to get some valuable cards of that colour, since the value of his cards will be your victory points! But, if you let him get too many points, you risk loosing the majority altogether. There will also be cards that you do not want to win, because it will give your opponent more points if he has the majority. But what to do if you throw a double five, and you really don’t want sailor number 5?? Luckily, there are the Dirty Trick cards. They are mixed in with the sailor stack, and can be won just like sailor cards, by putting dice next to them. 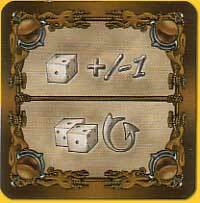 Later in the game, they can be used for a reroll, or to alter the number on your dice by +1 or 1, or to place both dice with a sailor card instead of just one. But, you can play only one Dirty Trick per round, so use them wisely!